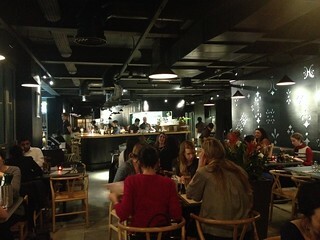 We were a party of ten on a Friday evening and this restaurant in Peckham was heaving. Tables were packed in close together and we were crammed in. It was noisy and lively befitting a Friday evening – the start of the weekend – but the acoustics were poor making it difficult to hear conversation. 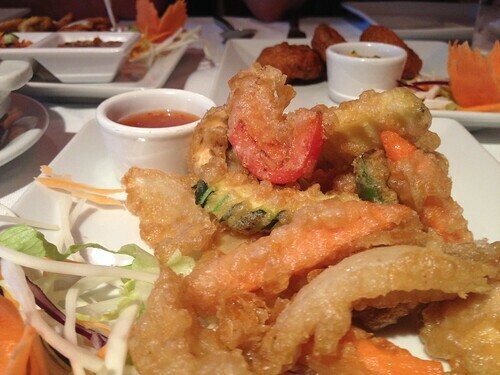 Dishes are designed for sharing. 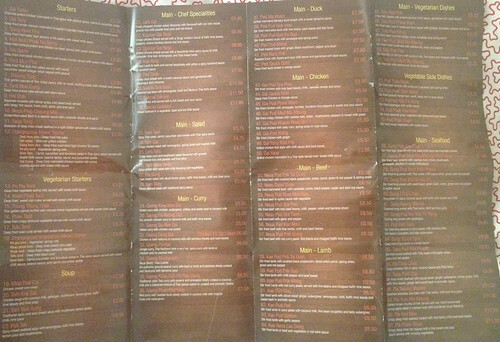 The menu offers 12 dishes, roughly half are starter portions and the other half mains. 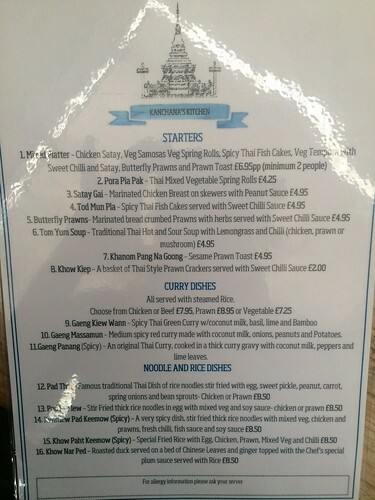 Plus limitless Jasmine rice and sticky rice @ £2.50 a head, and a choice of three desserts. Drinks took ages to arrive and weren’t altogether correct when they did. That continued throughout the meal. By the time they did arrive, we were happy to accept whatever had been brought. Servers were busy and under pressure; service was hit and miss. We ordered most plates from the Thai tapas menu to share (the food was amazing – top marks to the kitchen) starting with a peanut and ginger miang (a bite sized snack, wrapped in a leaf) with pomelo (citrus fruit), dried galangal, palm sugar, seaweed, and caviar wrapped in betel leaf @ £5.60 – absolutely gorgeous blend of flavours; a salad of salsify, betel leaf, lemongrass, coriander, peanuts, Thai shallots (there’s an option to have this salad with chargrilled duck) about £10.00; and a morning glory stir fry with garlic and fermented yellow bean @ £6.50. This menu is really pleasing for nut lovers like me. 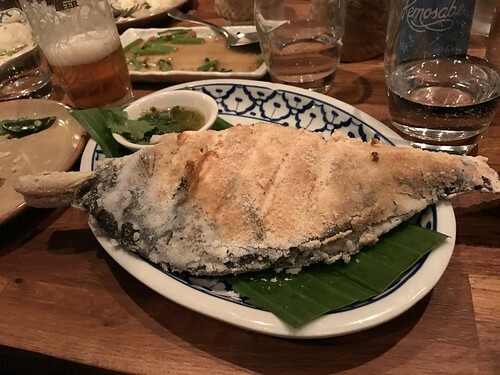 This charcoal grilled salt-crusted gilthead bream was a hit (we ordered more). 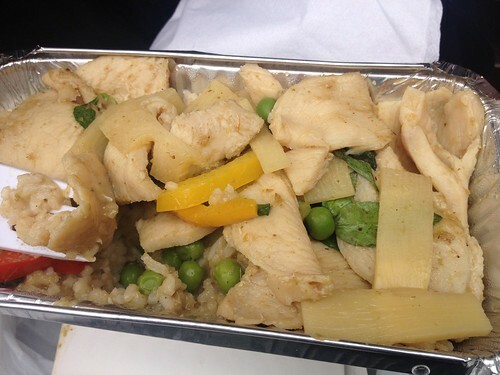 You can see what it looked like whole (above) and the soft white fish-meat inside is pictured below. 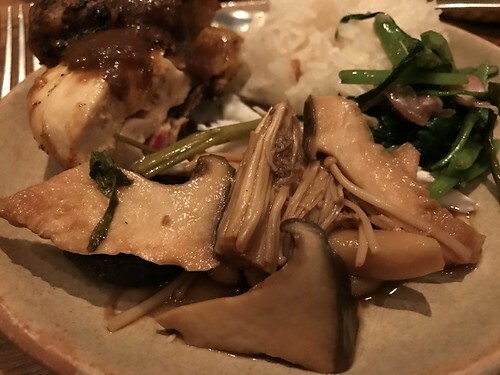 Other dishes we shared included chargrilled sticky chicken @ about £12.50, a mushroom parlow – king oyster mushrooms, shiitake, hens egg, and pickled morning glory (Thai green stems) @ £9.50 and of course – an unlimited supply of Jasmine rice and sticky rice. For dessert we shared a dish of coconut saffron rice, pomelo, satsuma, cognac caramel, cobnuts, puffed black + flat rice, jasmine smoked coconut cream @ £6.00 and banana fritters made with a coconut sesame batter, tamarind, peanut brittle, and turmeric custard @ £6.70 (exceptionally good). The verdict: Prepare for noise, being squashed in, hit-and-miss service and excellent food. 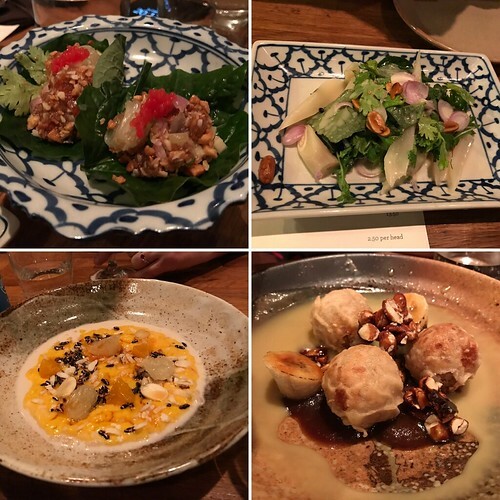 This ‘Thai tapas’ concept menu puts an interesting twist on traditional Thai food. It’s worth a visit. H, K and I chose The King’s Arms pub to meet last Saturday night, for its proximity to Waterloo and because they serve rotating craft beers. Roosters was on, on our visit. So, home from home. It was surprisingly quiet for a Saturday evening especially given they were showing the Euro 2016 football matches, on big screens. 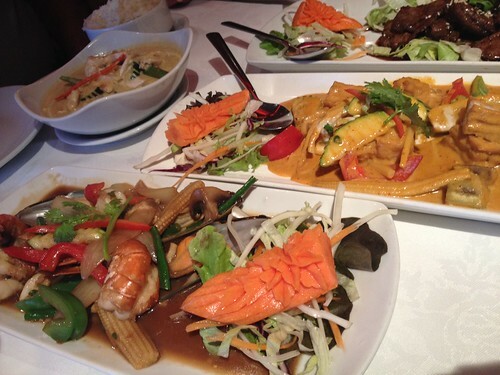 Pleasingly for us, we were able to get a table in the Thai restaurant, Kanchana’s Kitchen in the back room. 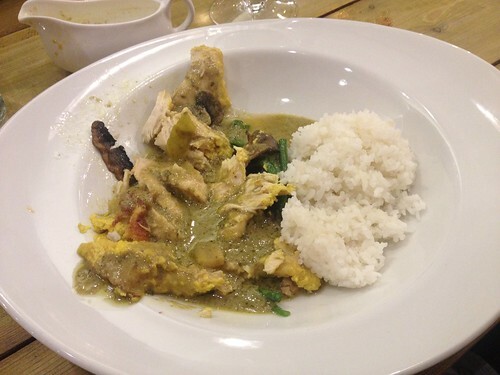 H and I both chose the chicken green Thai curry with steamed rice, made with basil, lime and bamboo. It tasted good so we overlooked the shabby crockery. 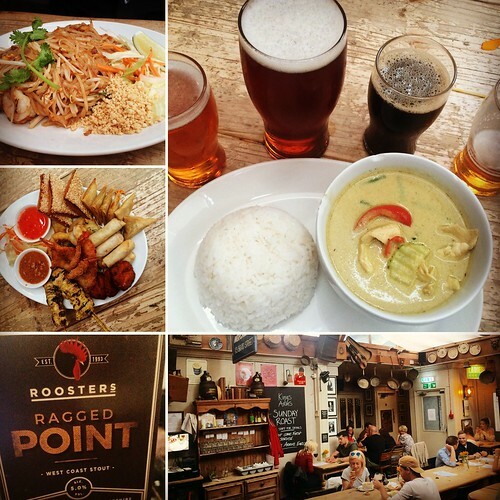 The verdict: Convenient for Waterloo station, good Thai food, nice enough craft beers (though the choice was somewhat limited) on Roupell Street, an appealing quaint back street formed of old London terrace houses. It’s handy if it’s handy. 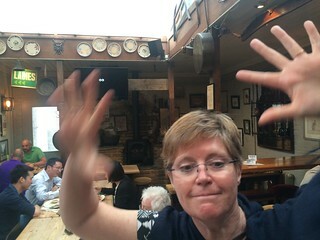 After a cultural Sunday outing in London – visiting the Soundscapes exhibition at the National Gallery followed by a coupla beers in a (fairly scuzzy) traditional pub – H, K and I wanted to eat out somewhere. After much deliberation (over another beer of course) we decided on a Thai restaurant in Covent Garden that we’ve been going to for over 15 years. Initially disappointed that it was closed, we were – ultimately – delighted to stumble across Pacata while aimlessly wondering what to do. Situated on New Row (a quaint, narrow side street just off St Martin’s Lane) Pacata’s shop-front is small and unimposing. 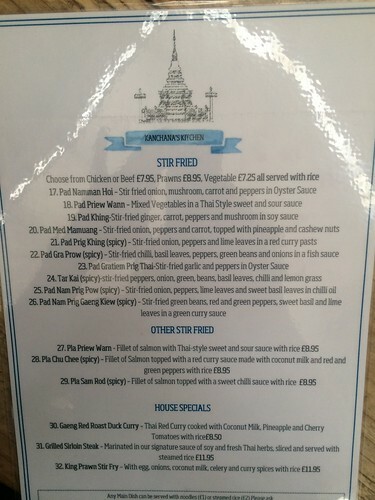 A printed menu propped up in the window caught our eye – an Asian fusion menu serving dishes as diverse as burgers, Thai curries, steaks as well as ramen and pasta, all with an Asian twist and in the currently trendy ‘street’ style. Something for everyone, deliberations sorted. 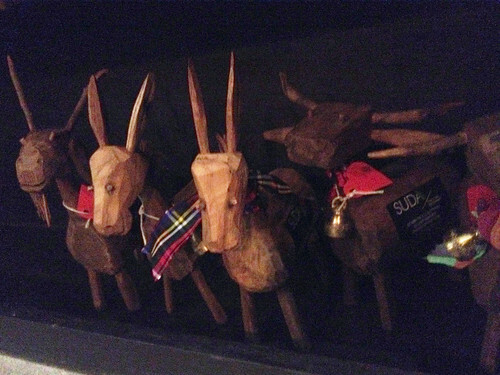 The restaurant interior was appealing from the moment we stepped in, with its mish-mash of wood furnishings and eclectic lamp collection. 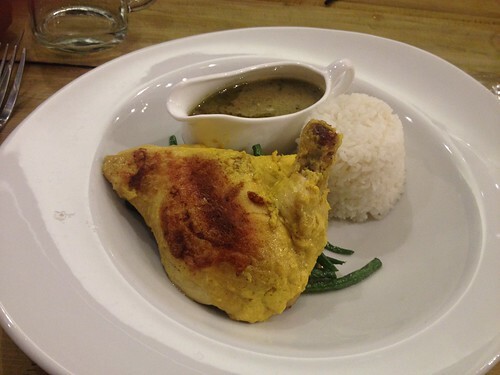 For main course, H and I both chose grilled chicken breast served with mushrooms, green beans and Jasmine rice @ £12.95. 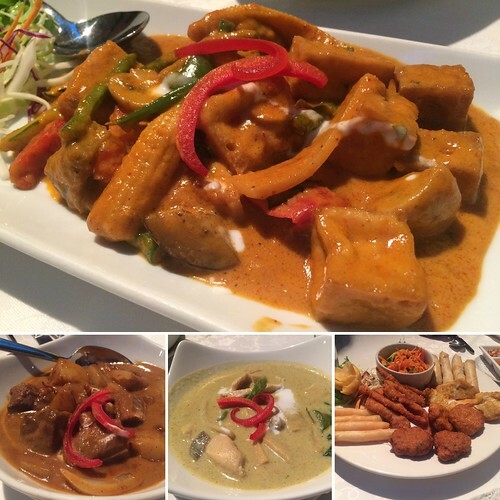 There’s a choice of curry sauce (green Thai, Massaman or Japanese) – we both chose green Thai. The presentation of the sauce was such that it was a thoroughly enjoyable experience choosing how *you* want to eat this unconventional Thai green curry. 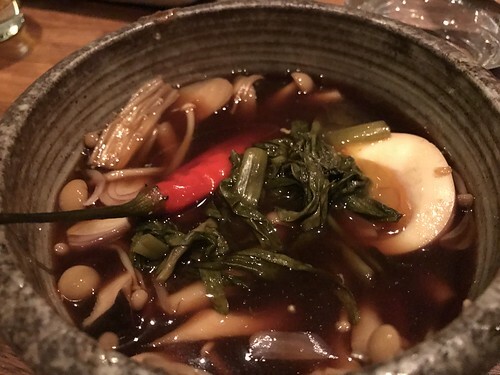 Either way, it feels like a good and different experience, that engages you (the eater) to customise your Asian curry food in the way you want to eat it. Simple but effective. 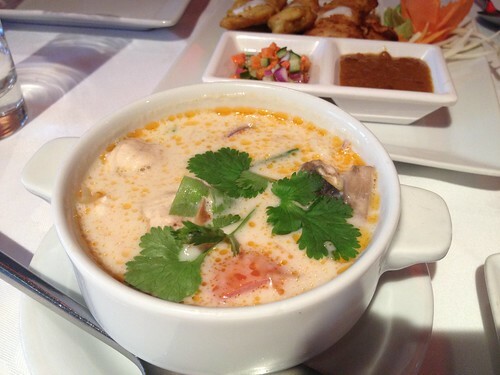 K chose this tom yum chicken ramen with a twist: a complete chicken breast on the bone served in a tomato cream soup with egg and spring onions @ £12.95. We were having such a relaxing, comfortable experience here we felt like lingering. And so ordered a round of digestifs (our waitress was unfamiliar with Courvoisier and took several attempts to serve it with “no ice” but at room temperature as it’s meant to be). 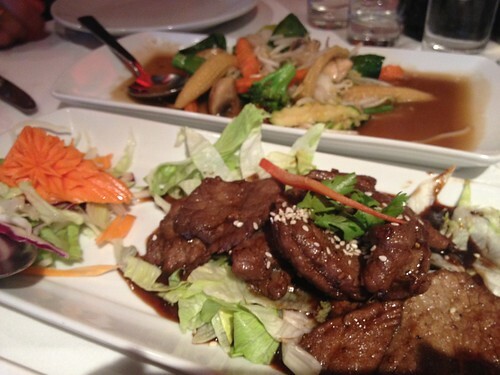 Altogether, our bill for three people came to £127.00 including service. 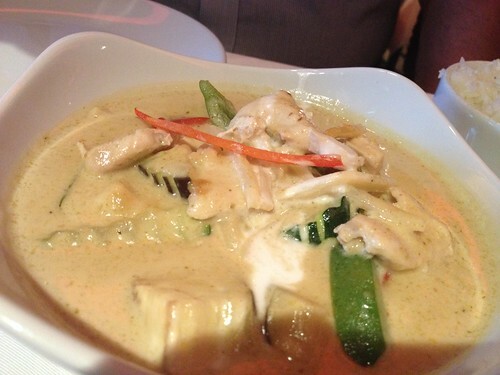 “The best chicken green curry outside of Thailand, guaranteed” claims Suda’s menu. A bold statement, no? I was sucked in, and had to put it to the test. 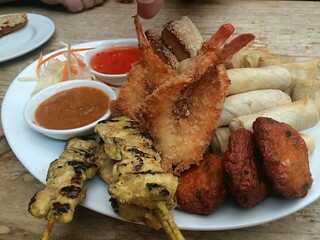 But first, S and I shared a starter of tod mun and prawn skewers (not ‘lollipops’) @ £5.95. 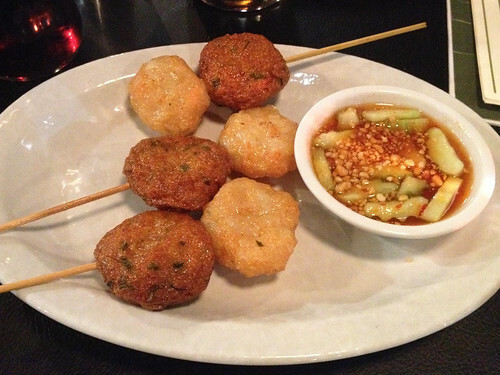 The tod mun fishcake balls were perfectly squidgy and spicy, while the deep fried battered prawn balls were a pleasant enough texture contrast but not particularly exciting. 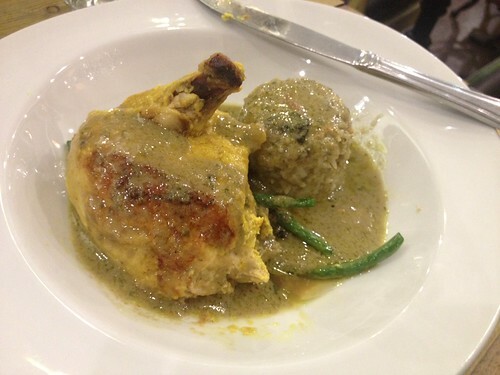 For main course, S had kao pad pak ruam @ £8.25 – mixed veggies stir-fried with brown rice (healthy and tasty) and I had the Gaeng kiew waan gai – “the best” green chicken curry @ £11.00, which has a 2-star spice rating (an “intermediate” spicy level, and was spicy-tasty, not spicy-fiery-hot). 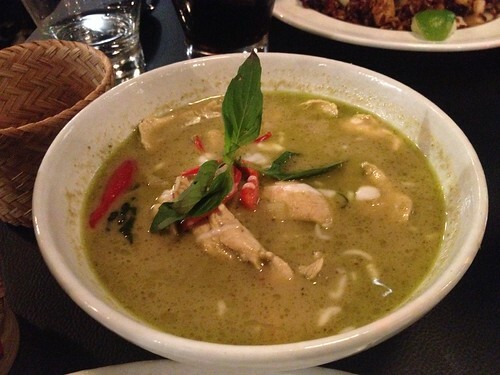 At first glance the green curry looked very soupy and watery but the liquid was packed with flavours, particularly basil which I love. And the sticky rice @ £3.00 readily absorbed the juice. 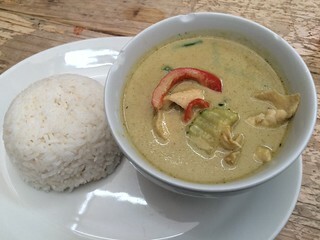 Of all the green Thai curries I’ve eaten in the twenty years since I went to Thailand, I honestly can’t say if this was “the best” of them all (I can’t *remember* them all) but it was up there, ranking highly. To drink, I had a couple of glasses of Monsoon Valley Chenin Blanc from Thailand’s Hua Hin Hills vineyard (my first wine from Thailand) @ £5.10 a 175ml glass – medium dry but with sweeter after notes than Chenin Blanc normally has, which made a perfect pairing with spicy food. 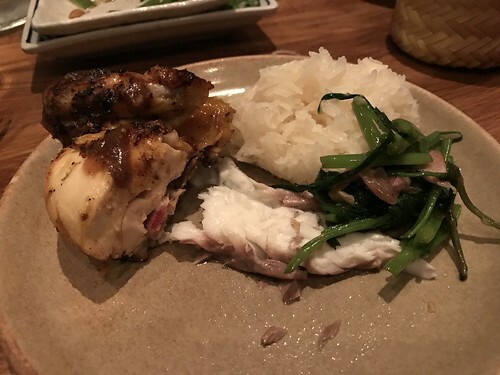 The verdict: Spacious restaurant that felt comfortable and relaxing with its black patterned walls and dark decor and soft lighting; attentive and pleasant service and great Thai food, reasonably priced. If you’re in to puddings, the choice is limited. Situated in a residential area and semi-industrial park, Orangegrass doesn’t look like it’s up to much from outside. And it’s not in Shields’ town centre so it would be easy to miss. But step inside the entrance of 7 Mount Terrace (it has the appearance of a community hall) and head straight upstairs to the pristine restaurant, where polite staff in smart Thai traditional silk outfits are waiting to greet you. 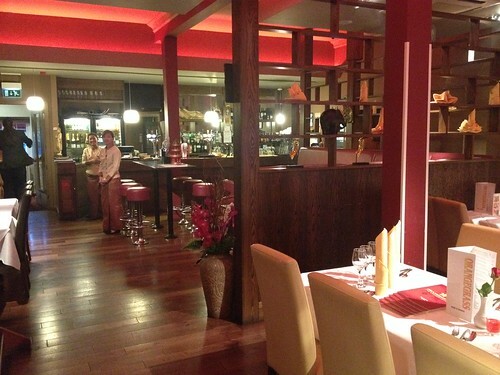 The restaurant is an appealing, high-ceilinged capacious room split into different sections. And on our visit last night we were thoroughly well looked after by our server. There’s a great wine list too. We homed in on a bottle of Opal Ridge Gewurztraminer Verdelho 2013 (assuming this would go well with spicy food, which it did) while contemplating the food choices. Menu The verdict: totally impressed. I’m already looking forward to my next trip to South Shields. There’ll be tears if it doesn’t involve a return visit to Orangegrass. While it’s nice to order take-aways from tried-and-tested favourite restaurants, it’s also good to try something new from time to time. 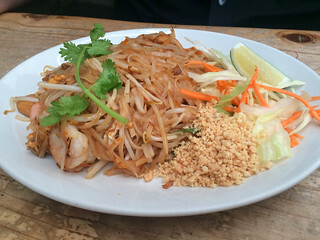 Last weekend we wanted Thai food in the Clapham area (Amazing Thai was closest and we’ve eaten there many times over the years; it’s good but slightly over-priced for small portions so we fancied a change). 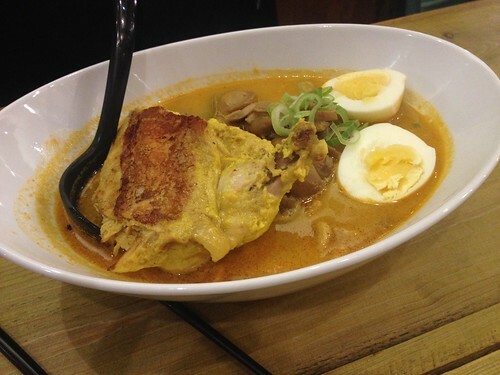 We decided to try out Pimlico-based Yum Yum instead. 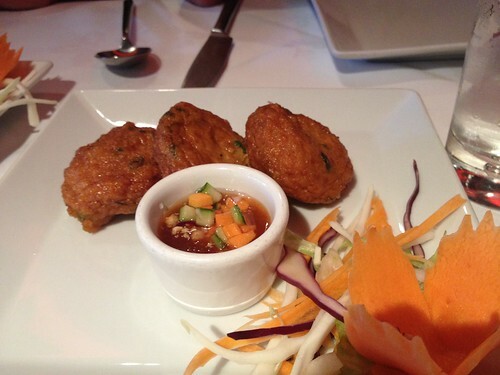 Ordering online through Just Eat (a straight-forward, reliable process) we chose tod mun Thai fishcakes @ £4.90 and Tom Yum Thai soup @ £3.50 for starters (good fishcakes but the Tom Yum soup was so oily it had totally separated). 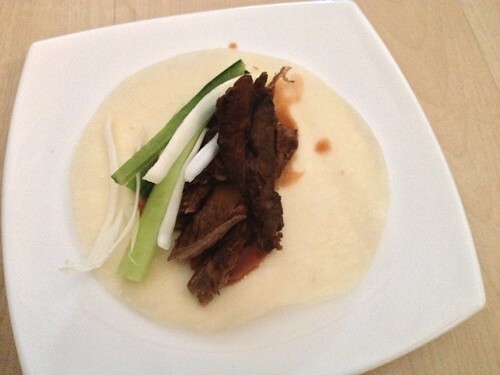 K and I both love aromatic crispy duck pancakes. Yum Yum also does a crispy lamb variety @ £6.95 so we decided to try it (nice enough, the lamb was slightly tough, I’ll stick with duck in future). 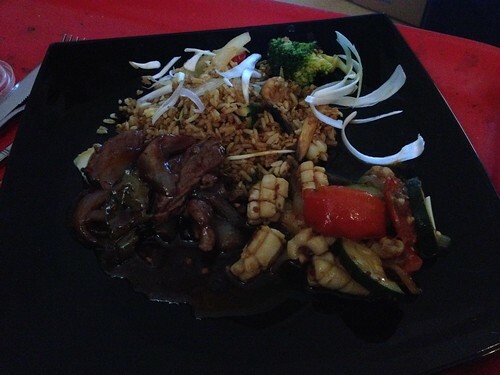 For main course we shared squid sambal @ £5.99 and beef in black bean sauce @ £5.80 with an egg fried rice @ £2.99 and vegetable nasi goreng @ £5.00. The sambal and nasi goreng (Indonesian fried rice) weren’t a patch on Nancy Lam’s (the squid wasn’t as tender as it could have been, and there was too much chilli in the sambal sauce making it overly fiery) but were enjoyable enough all the same. Yum Yum positions itself as Chinese (they do a range of dim sum) but the menu offers as much Thai and Malaysian food too. 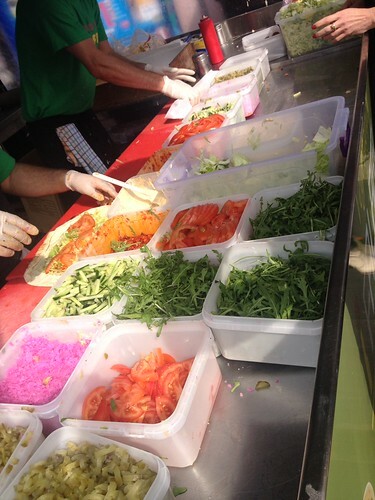 It may have rained all week but it’s Friday, it’s lunchtime and Goulston Street food court is just around the corner. So all is well. Among the international ‘street food’ stalls here in East London (near Petticoat Lane/Middlesex Street), there’s something for everyone. I’m gradually working my way around all the stalls (on different days, of course!) and haven’t been disappointed yet. 01. Lebanese falafel The first stall you come to, if approaching from Whitechapel High Street, is – I find – hard to resist. It’s worth stopping just to watch the happy chappies there assemble wraps at super-sonic speed. 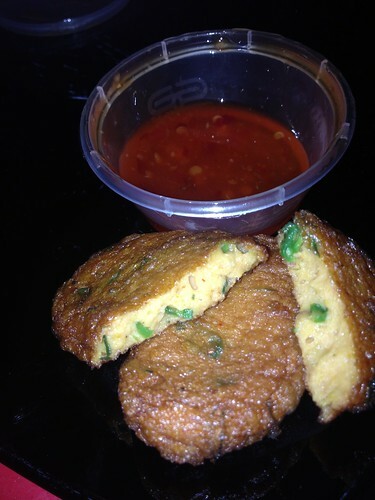 And they still find time to give you bits of deep fried falafel to munch, to keep you happy while you wait. 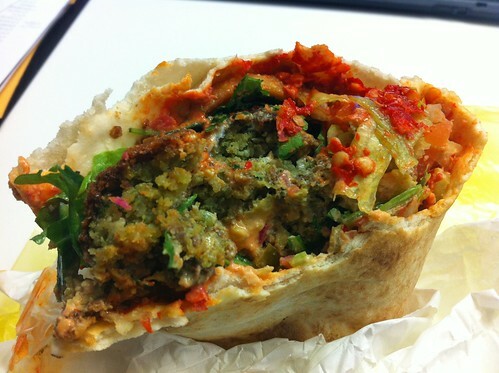 It’s £3.00 for a medium size wrap which is stuffed full of falafel (of course), salad, pickles, humous, chilli sauce (if you want it) and even a few chips (a bit odd but again – only if you want it). This is a filling – and fairly well balanced – meal for me. 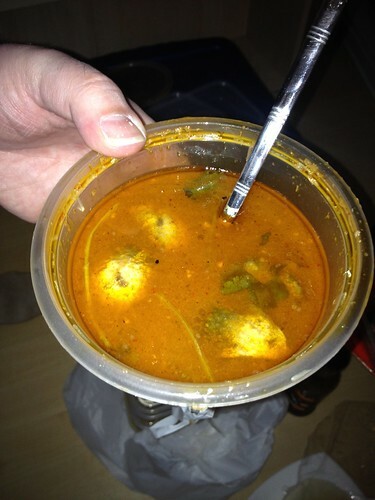 It’s flavoursome, fresh, spicy and totally amazing. 02. 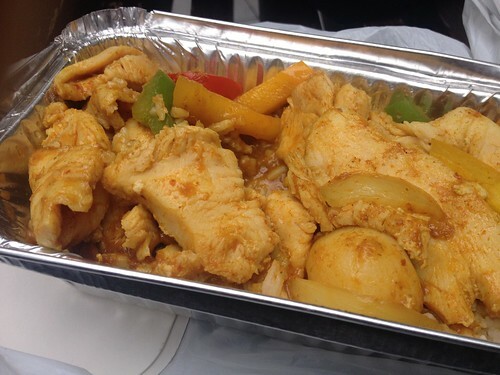 Moroccan fish At the 3 habibis stall, a spicy fillet of fish is griddled fresh in front of you. 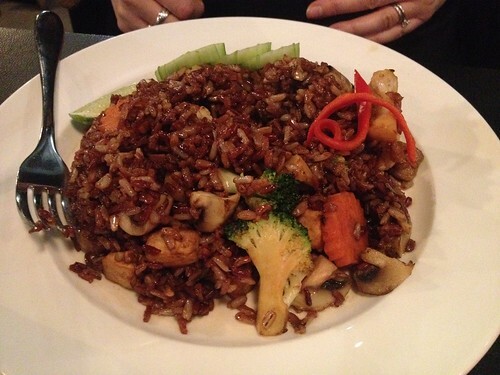 Choose your selection of vegetables and either rice or a wrap to go with it. All for only £4.50. Just divine. 03. Satay Bangkok The chicken in the chicken satay is so tender it’s as if it’s been slow cooked for hours (perhaps it has, in their industrial size woks?). 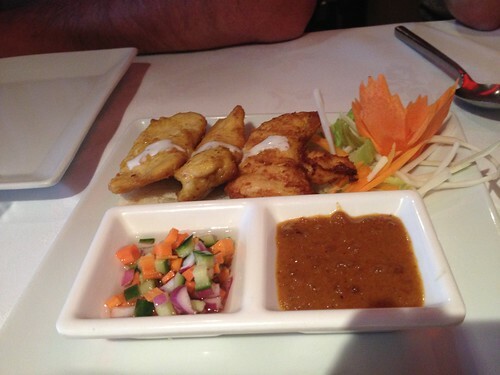 Served with a smooth, peanutty sauce and a side salad at only £4.50 this is great value for such a tasty meal. Choose from the suggested dishes pictured around the serving hatch (or you can go off-menu) and watch fresh ingredients being cooked to order right in front of you. 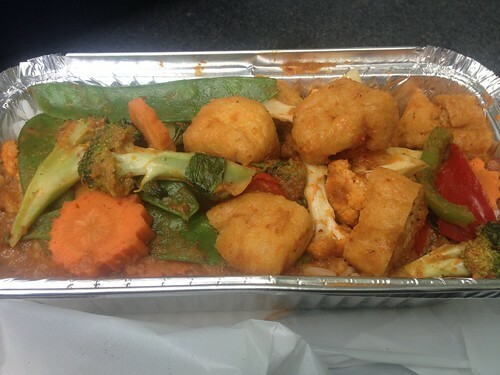 The spicy (eye-wateringly so) tofu Thai red curry is excellent value @ £4.50 and contains sweet basil, red and green peppers, peas, bamboo shoots and mixed veggies (carrots, mange tout, cauliflower and/or broccoli) cooked in coconut milk. Excellent. 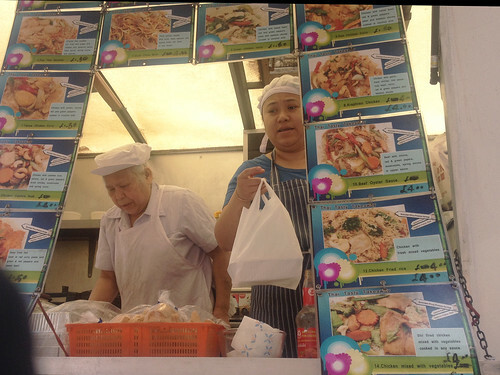 Other stalls include Japanese katsu, Beijing dim yum, Jordanian rice and meat dishes, and more. Very, very good – check it out.